Our Graduate Certificate programs provide advanced legal training over one term of full-time studies to candidates who wish to pursue graduate legal education for a limited period and particular career-related purposes. Graduate Certificates are awarded upon completion of 15 law course credits. Certificates are course work programs, and no thesis or research project is required. Unlike the LLM and DCL, fees for the certificates are calculated based on the number of credits taken. Offering advanced training, the Graduate Certificate in Comparative Law is particularly appropriate for jurists who wish to pursue graduate-level studies in areas such as civil, commercial, or human rights law. 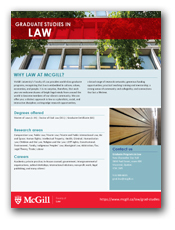 The Graduate Certificate in Comparative Law is awarded after one full-time term of residence in the Faculty and upon the completion of 15 course credits. In every case, the program is structured to meet individual needs and must be approved by the Associate Dean (Graduate Programs). Please note: ALL international students must apply for a student visa. Non-Canadians must obtain permission to study from the governments of Quebec and Canada. Immigration Quebec issues the Certificate of Acceptance of Quebec (CAQ), and Citizenship and Immigration Canada issues federal Study Permits. You may also wish to contact International Student Services for assistance. The Graduate Certificate in Air and Space Law is particularly appropriate for jurists and other professionals who wish to pursue graduate-level legal studies in aviation, air and space law, government regulations, conventions and treaties dealing with these areas. It is a course work program that is particularly appropriate for students with a strong professional orientation. The Graduate Certificate in Air and Space Law is awarded after one full-time term of residence in the Faculty and upon the completion of 15 academic credits of law courses. Those credits must include three required Air and Space law courses (ASPL 633, ASPL 636, and ASPL 637), which are all offered in the Fall term.